Note: This article originally appeared at Your Wardrobe Unlock’d. It has been revised since then. All images can be enlarged by clicking. Are you familiar with fashion sketches? Pull out almost any sewing pattern and compare the images: on the front is a full-color sketch, perhaps alongside a photograph, and on the back is a basic outline of the garment. The simplified design is known as a flat, and is often used by pattern makers as a technical drawing, to show what details the pattern includes. What really sells the design, however, is the image on the front: the fashion sketch, or croquis. Croquis (pronounced kro-kee) is French for “sketch.” Unlike the flat, a croquis can be creative and inspirational. It’s presented as three-dimensional and often in full color. Most importantly, it shows the garment as it looks on a model. If you want to design your own fashions, you’ll do well to learn how to make your own croquis. It isn’t as hard as it seems, but to really master the art will take practice. 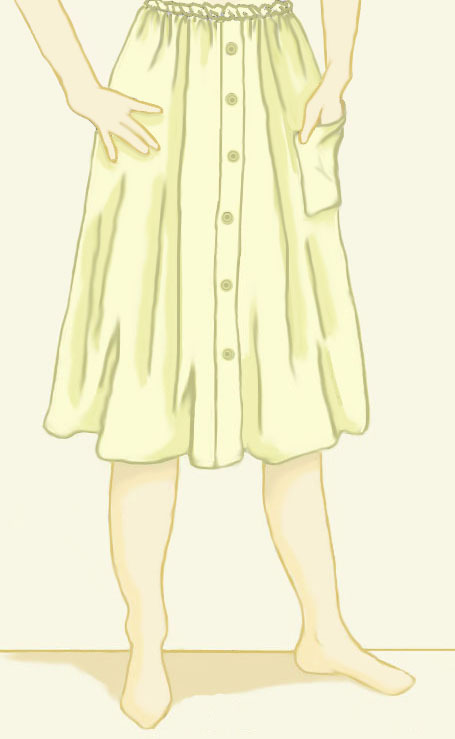 Before you learn to draw garments, you’ll need a basic blank figure, a base upon which to draw your clothing. Let’s begin there. You don’t need much to get started: just a sheet of paper and a pencil. Copier paper will do in a pinch, although high-quality sketching paper is always preferable. Eventually, you’ll want an array of sketch pencils, including at least one that’s soft (2B) and one that’s hard (2H). 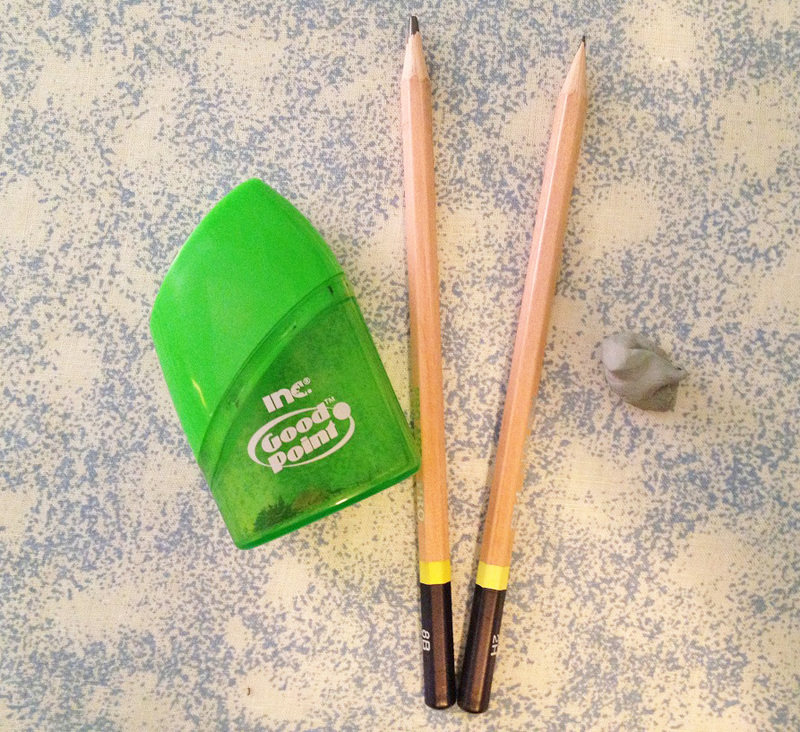 Keep your pencils sharp. Any hand-held sharpener will work for this purpose. 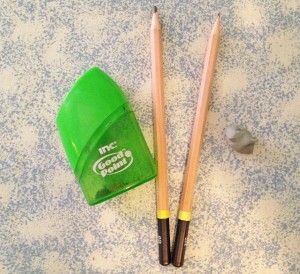 For erasing, a kneaded eraser works best. They are inexpensive and you can tear off small chunks to use, making it an investment that will last awhile. Now that you have your supplies, let’s get started. First, you need to understand the concept of heads. The typical human body can be divided equally by the length of the head. 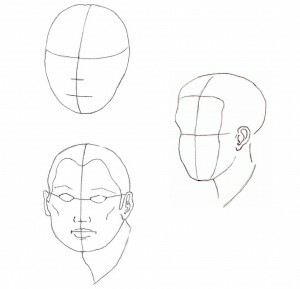 Using the head as a reference when drawing will help ensure that your figure is proportioned accurately. A normal woman stands about 7 ½ or 8 heads high, but the exaggerated figure of a fashion model is taller and more slender, standing 9 or 10 heads high. I prefer a more natural croquis, so my models are all 8 heads tall. The first head, naturally, is from the top of the head to the chin. The second head extends from the chin to about mid-bust. 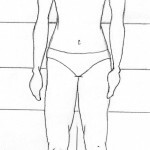 The third head reaches to the natural waist; the fourth almost to the bottom of the pelvis. The fifth head ends about mid-thigh, while the sixth reaches the knee. 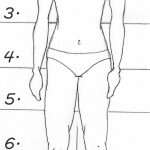 The seventh head extends to mid-calf, and the final, eighth head, stops at the bottom of the feet. A woman’s shoulders are about 1 ½ heads across, and the tips of the fingers end about three-quarters into the fifth head. To begin, we’re going to make a stick figure. Be sure and draw with a light touch, so you can easily erase any lines you’re not happy with. All of the guide lines will be erased when you’re finished, so they must be done lightly and with a soft pencil. 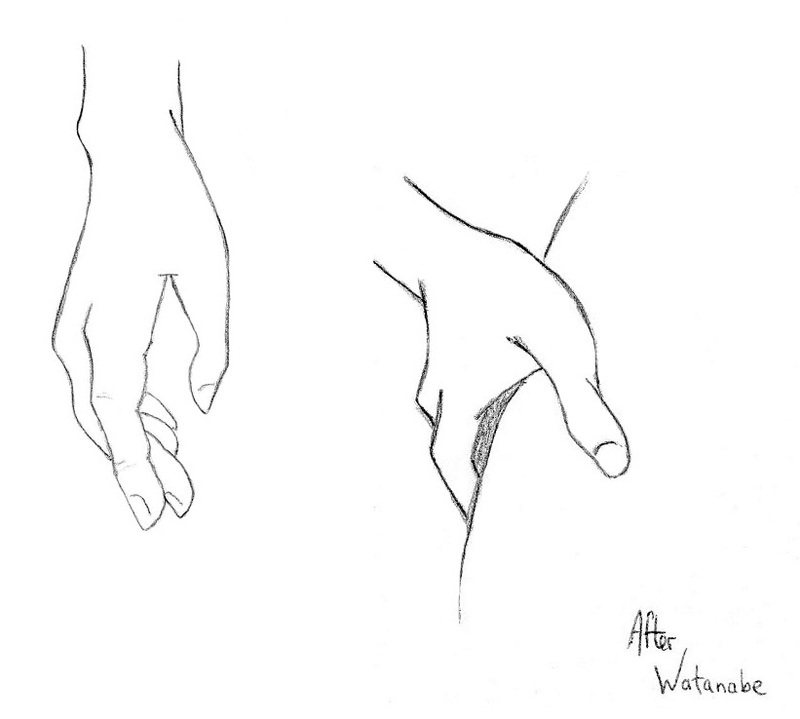 Once you’ve had plenty of practice, you’ll be able to draw your figure without the guide lines. Draw an oval that represents the head. No need for features or details yet—just a blank oval. Make a straight line down from the center of the head to represent the body. Now, take a scrap of paper and line it up next to your head. Draw two short horizontal lines that match up with the top and bottom of the head. Employ this as a ruler to check your proportions. Use it now to determine the height of your figure—draw light marks along the line to show each of the 8 heads. The next step is to determine what pose you want your figure to hold. 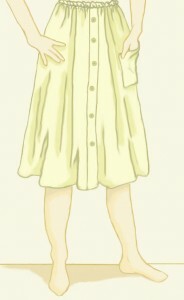 Many fashion sketches show a woman in a spirited position, such as with the hips tilted, one leg stuck out, and a hand on the hips. These are more complicated however, so for this first figure, we’re going to stick with a basic, straight pose. 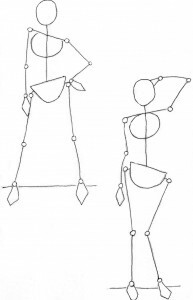 Keeping with the stick figure idea, draw a line for the torso and two connected lines for each arm and leg. 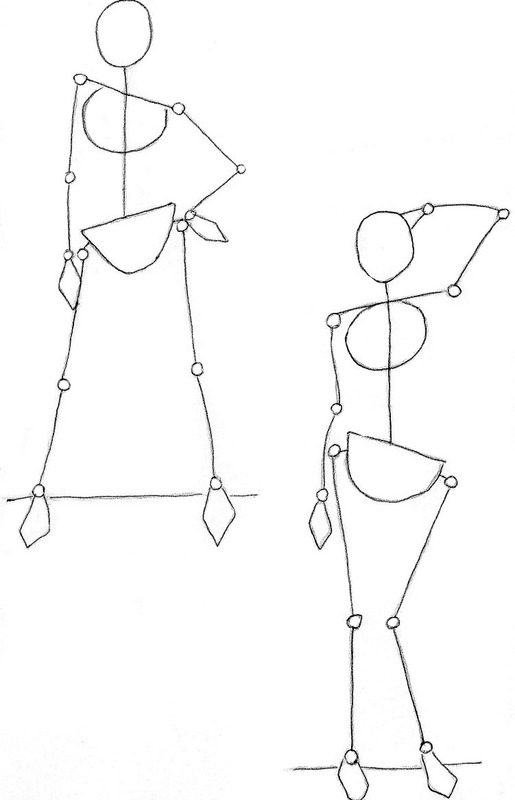 Small circles will represent the joints: shoulders, elbows, hips, knees, and ankles. Once you’re happy with the position of your figure, add a neck, outline the torso with a circle, and let a rounded triangle stand for the hips. Draw wedges for the feet and hands. Don’t worry, you’ll come back later to make the figure more realistic. You can determine what sort of figure your model has. Remember—she doesn’t have to be straight and slender like most fashion models. Feel free to give her some curves! If you’re drawing fashions that you’ll sew for yourself, try to sketch your own body. To determine your shape, have someone take your photograph while you’re wearing a bathing suit, or a snug camisole and leggings. Trace the outline of your body with a marker to make it easy to see your contours. Measure the length of your head and use this to determine your personal proportions. Unless you are unusually short or tall, your body should be somewhere between 7 and 8 heads tall. Your shoulders and hips might vary from the average width, depending on your body shape. Your croquis doesn’t have to be exact, but give it a suggestion of your shape, especially if you’re going to use it to design clothes for yourself. Once you’ve determined your shape and proportions, begin to outline your figure. Limbs should be curved, not straight. If you want to get adventurous, you can pose your model. Draw a line across the top of the hips and the shoulders. To have a dynamic or interesting pose, these lines should angle away from each other. If one leg is stuck out and the hip is dropped on that side, the shoulders will often tilt the opposite direction. Stand in front of the mirror and see for yourself. If you’ll be doing a lot of fashion sketching, buy a wooden artist’s mannequin. These stand about ten inches tall and are fully articulated, so you can pose them any way you like. They come in male or female versions, and are fairly inexpensive. They make excellent references for drawing fashion sketches. Just keep in mind that their proportions aren’t always accurate. Mine, for example, has extremely long arms. In real life, no one’s hands hang down to just above their knees! Once you’ve decided on a position for the body, figure out what you want to do with your model’s arms. It always looks good to have one hand hanging at the model’s side and the other arm bent, with the hand posed in front of the body. You can change the exact positions for variety. Pull out a sheet of paper and draw several different poses in miniature. See which one you like best and then draw a full size version of it. 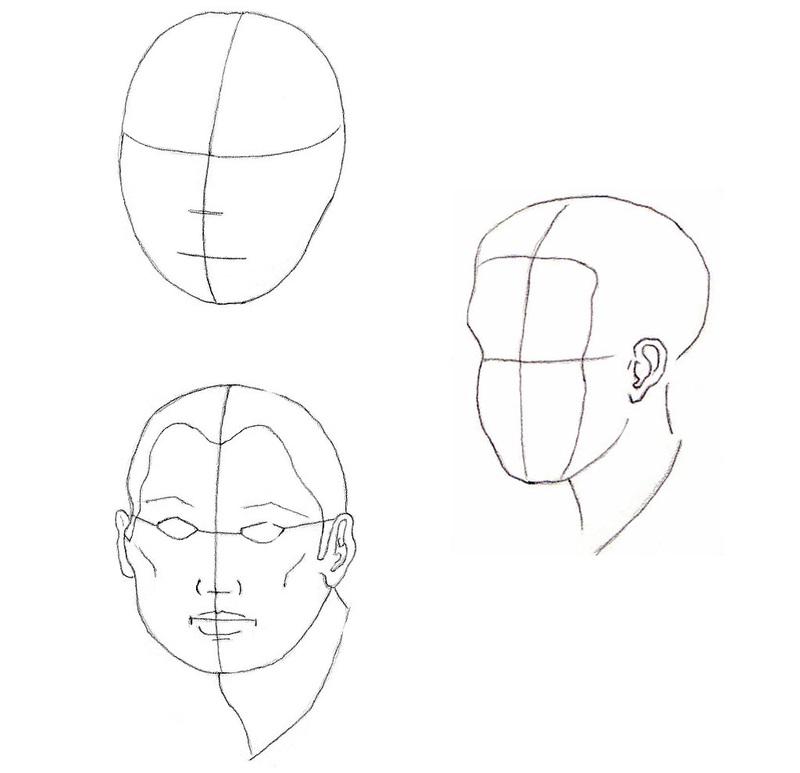 If you would like to add features, begin by drawing a line across the oval of your face about halfway down. This is where the eyes go. Draw a second line slightly more than a third of the way between the chin and your eye line—this is for the nose. The mouth will go halfway between the nose and chin. If your head is turned at all, the back of the skull will protrude beyond the egg shape of the face. 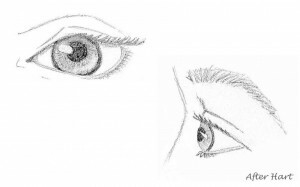 Eyes are generally small ovals, though you can stylize them into narrow rectangles, or diamonds, or any interesting shape that conveys an expression. How far apart do you make the eyes? This can vary for stylistic purposes, but for a realistic proportion, set your eyes with the width of one eye between them. 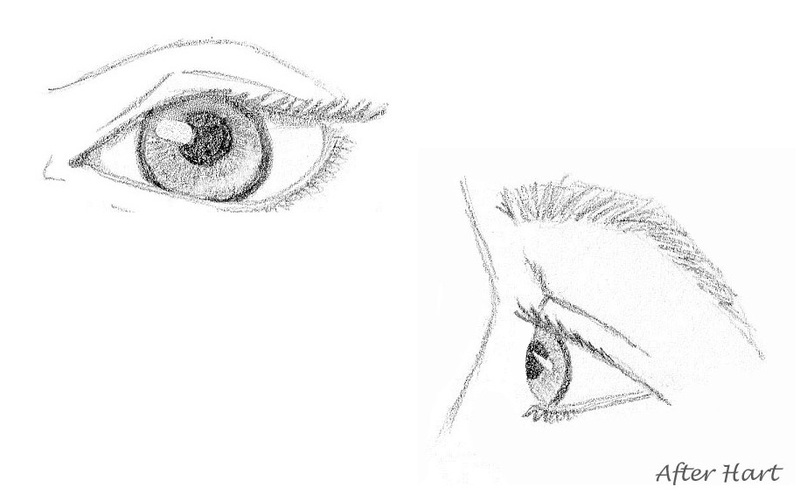 Eyes seen from the side are a completely different shape, more of a sideways V notch with a curve on the front. If you want to add detail, add the fold of the upper eyelid, and the little section on the sides where the tear ducts are. Note that the lower lashes don’t attach directly to the bottom of the eye, but to the lower lid. 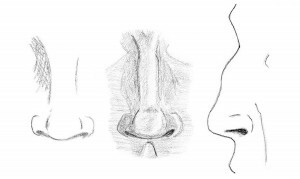 You can keep the nose simple—just a line to indicate the bridge of the nose and a few curves for nostrils. 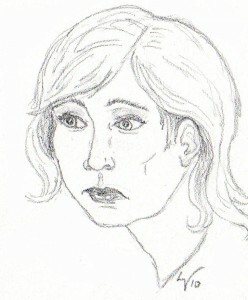 Or you can add shadow and depth to portray a fully formed nose. From the side view, the nose projects from the face. Don’t forget the dip between the eyes, or the shadow that forms at the edges of the nostrils. 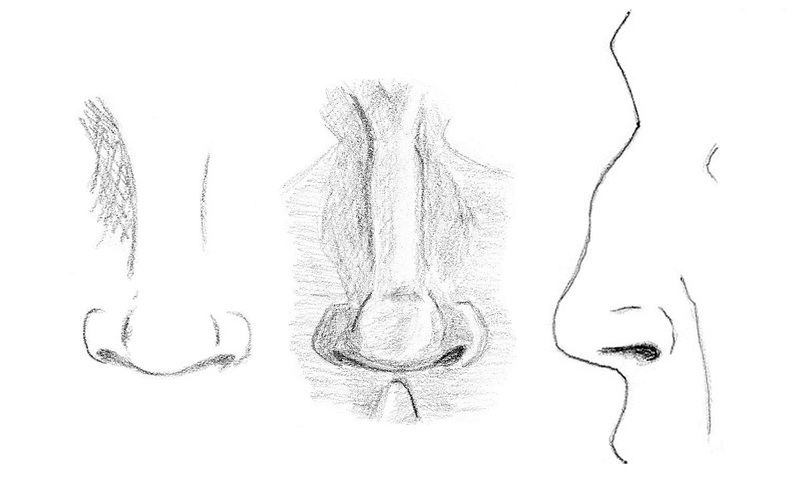 If drawing a profile, bear in mind that noses come in different shapes. Depending on the ethnicity of your model, you can draw a short button nose, a long, straight Roman nose, a slightly hooked nose, or something in between. Ears stick out from the sides of the head. Generally speaking, they reach from the level of the eyes to the level of the lips. They can be rounded or a have a bit of a point to them; they can be curved or squared. 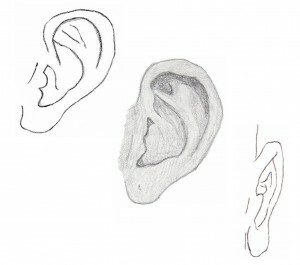 Depending on how the head is angled, you may see more of one ear and less of the other. 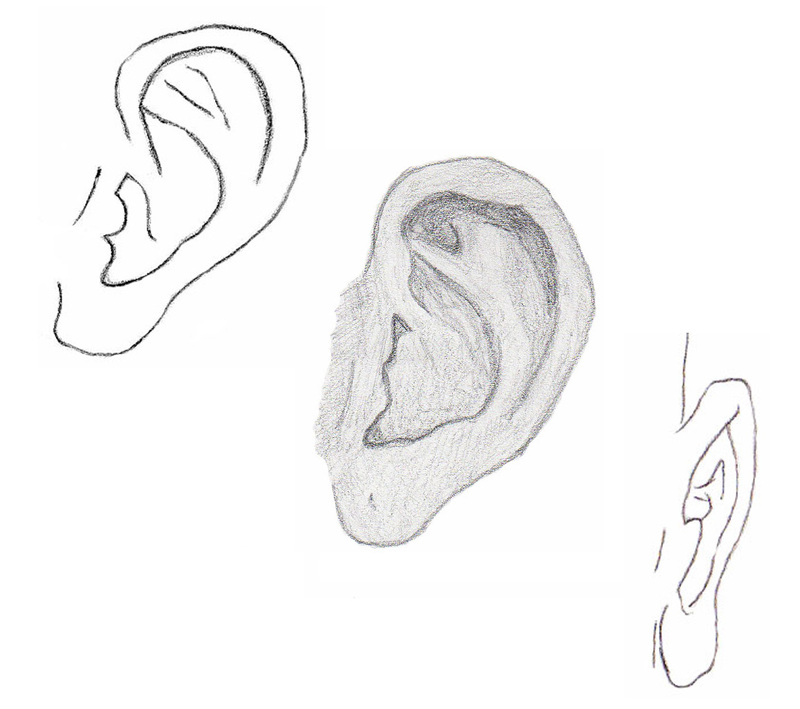 For a closeup, use shadow and highlights to portray the unique contours of the ear. 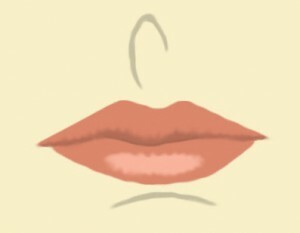 Lips must have shadow and highlights to make them look three-dimensional instead of flat. First establish the shape. Is the mouth open or closed? If open, teeth might show. 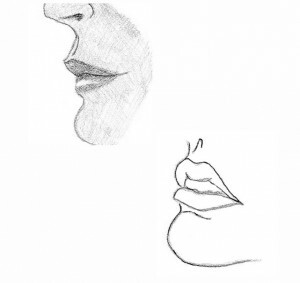 Generally, the lower lip is fuller and shorter than the top lip. Because of cast shadow on the upper lip, the lower lip is often lighter, with a highlight to indicate the outward curve. If the mouth is open, indicate teeth—but use discretion. Teeth should never be drawn individually. You only want the suggestion of teeth. Any more than that and your model will look like a cartoon. Add all of the features together to create a proper face. If your sketch is small, you won’t be able to add as much detail. If it’s difficult for you to draw small sketches, you might create a large, detailed sketch, then scan it and shrink it digitally, using a program such as Photoshop, or even Window’s Paint. Drawing hands and feet can be complicated. Some new artists get nervous and try to obscure the hands and feet, but this diminishes the impact of your fashion sketch. Keep them simple, if you like, but don’t hide them. A well done pair of hands and feet can make an otherwise dull sketch come to life. If you prefer, you can outline them without adding detail, but take care to get the shapes right. 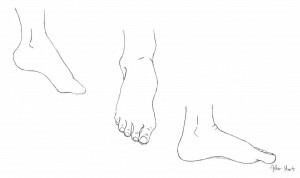 Bare feet are wedge shaped, wider at the base of the toes, then narrower at the end. Toes are longer than you’d think. In women, toes—especially the big toe—typically angle inward due to years of wearing too-narrow shoes. 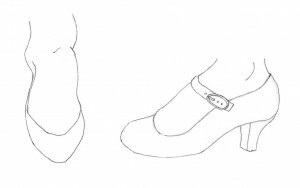 You’ll find a curve underneath the foot, at the arch, and don’t forget that the heel curves, too. 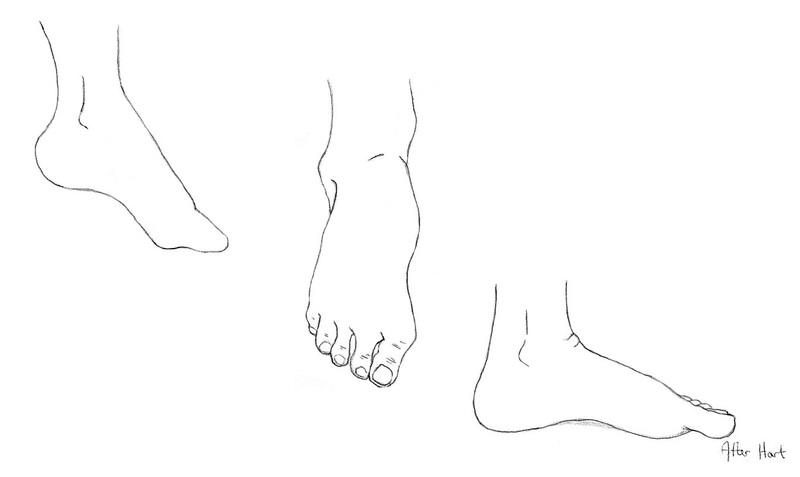 When drawing the ankle, keep in mind that the ankle bone is higher on the inside of the leg and lower on the outside. 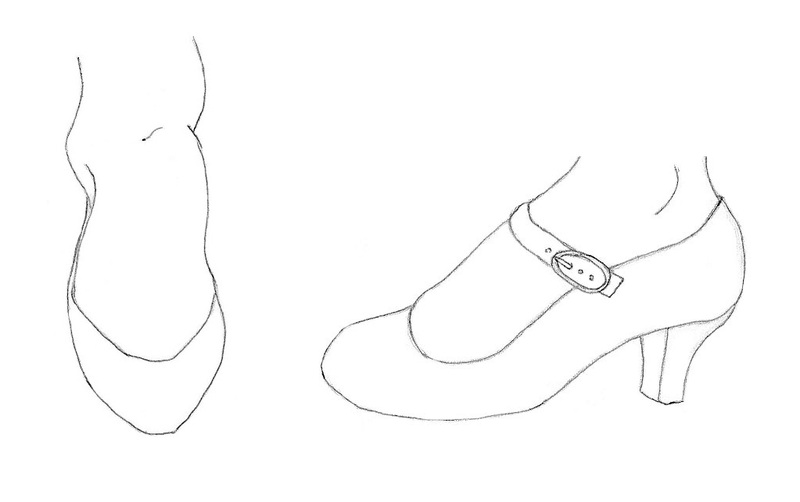 Shoes can be almost as difficult to draw as bare feet. 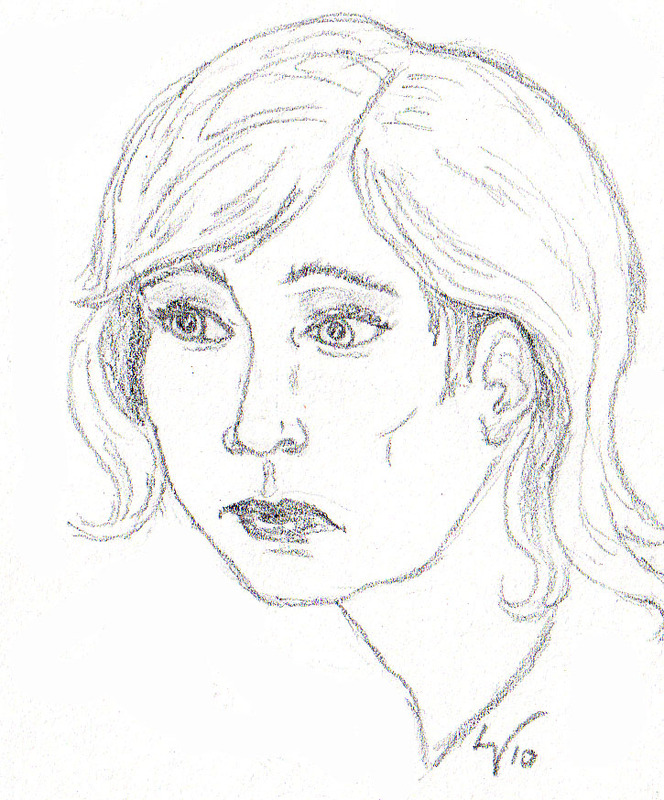 If not done accurately, your whole drawing will look off, so practice sketching them. Pull a few pairs of shoes out of your closet and place them on a flat surface. Study how they look at different angles and use them as a model to draw from. If you’re a woman, try on a pair of heeled shoes and sit on the ground in front of a mirror, to see your feet close up. Notice how the top of your foot arches? Rarely does a model stand with both feet flat on the ground, facing forward, so try drawing one foot bent on its toes, or perhaps angled away from the other foot. Hands are trickier. A woman’s hands must look elegant, so keep the fingers long and slender—but not too slender—and be sure to capture the shape of the wrist. Look at your own hands for guidance. When in doubt, keep your drawing simple. Fingers are tapered, not round, and they curve between joints. The base of the thumb is thicker and padded, and sits at an angle to the rest of the hand. If the fingers are spread, a slight amount of webbing should be visible. Don’t forget the bump of the wrist bone and the bumps of the knuckles. In the second half of this article, we’ll examine how to draw hair, including curls and braids. We’ll learn the tricks of adding shadows and highlights for a three-dimensional drawing. We’ll look at several do’s and don’ts for drawing clothing and fabric, and we’ll add color to our finished croquis for a fashion sketch that is both polished and sophisticated. Note: For more detailed drawing tutorials, please visit our deviantART account.